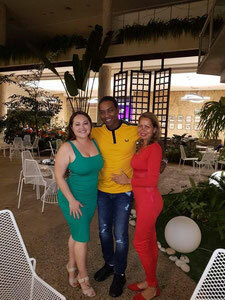 For better understanding and progress, it is important that you enjoy going out at night to dance and fully dive into the Cuban music. Therefore, the classes can be accompanied, if you wish, by the special offer of a taxi dancer, so that you can practice the movements learned with your teacher and thus deepen your knowledge. This service consists of going out at night with your dance teacher to a dance club to practice (usually from approx. 9:30 pm to 1 am) and has a price of 15 CUC per customer. The price only includes the dance partner for the evening (for max. 3 hours of dancing). You would have to pay the entry fee to the dance club, bar, restaurant or ballroom (priced normally between 3 and 15 CUC per person, depending on the location and the program of the day), the drinks for you and the dance teacher and your transport to the location and back home. If you wish to go to the Casa de la Música Galiano or Miramar with your dance teacher, we recommend you to decide for the matinee. The doors for the early concert typically open at 5 pm and the concert starts at approx. 7 pm, while entry to the late concert is not before 11 pm and it only starts after 1 pm and ends by 3 pm. As our dance teachers usually start work at 9 am the next morning, it would only be possible in exceptional cases to join you for a late concert. In addition, the entry fees for the late concerts are significantly higher (often between 20 and 25 CUC per person) than for the matinee (normally maximally 15 CUC per person). Please ask your teacher for the corresponding price. In order to guarantee our availability for your night out, we would appreciate if you could mention your request for the taxi dancer service when you book your dance classes. You could also send us the below online request form for the taxi dancer. However, please be aware that the taxi dancer service is only possible if you also book at least two dance classes. Please fill in this form to request a taxi dancer and submit your request. We will normally reply within 24 hours.